Maja Kastelic studied painting at the Academy of Fine Arts and Design in Ljubljana. Before starting her career in illustration, she worked as a retouching artist restoring frescoes. She lives in Slovenia. 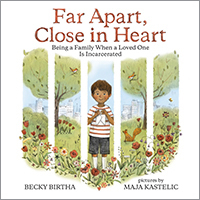 Children can experience many emotions when a parent is in jail or prison. They may be angry, sad, lonely, or scared. Sometimes friends act differently toward them. Sometimes the children begin acting differently too. In this important book, young readers will learn that even when it feels like nothing can get better again, there are ways they can improve their circumstances. Sending letters, talking to a trusted grown-up about their feelings, and even visiting a parent in jail or prison can help keep a parent close in their hearts. Use this title as a helpful tool to start a conversation with any child in this situation and to remind them they are not alone.